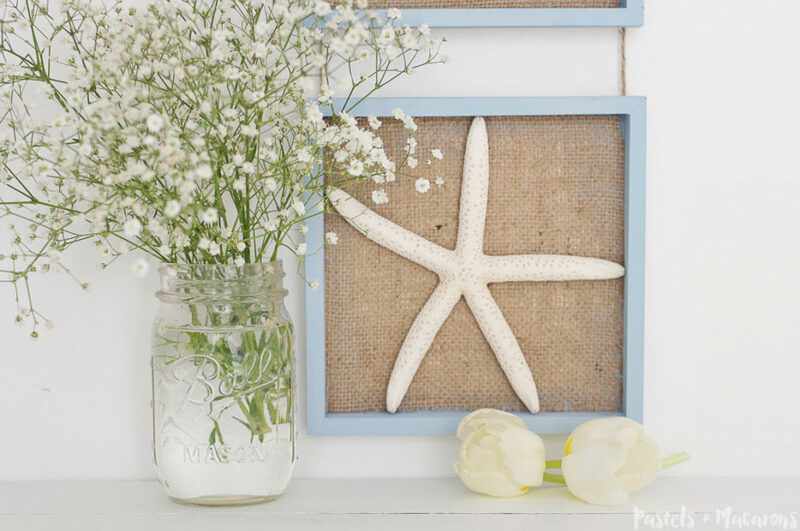 This starfish wall art will give your home that beautiful coastal look and feel on a budget. Lately I’m feeling as if I spend my days on the laptop or computer or my phone. I’m constantly on my blog and on social media, mainly learning and researching how to to better my blog but I’m struggling to write consistent content for the blog. It’s not that I’m not inspired… Trust me when i tell you I always have about five million ideas running around in my head at any given moment. I just lack time. As a mum to two toddlers who are 16 months apart can be busy, specially with no family around. They, of course are my priority but this also impacts the amount of projects I can take on around the house. A couple of weekends ago my husband was kind enough to give me some “me” time. 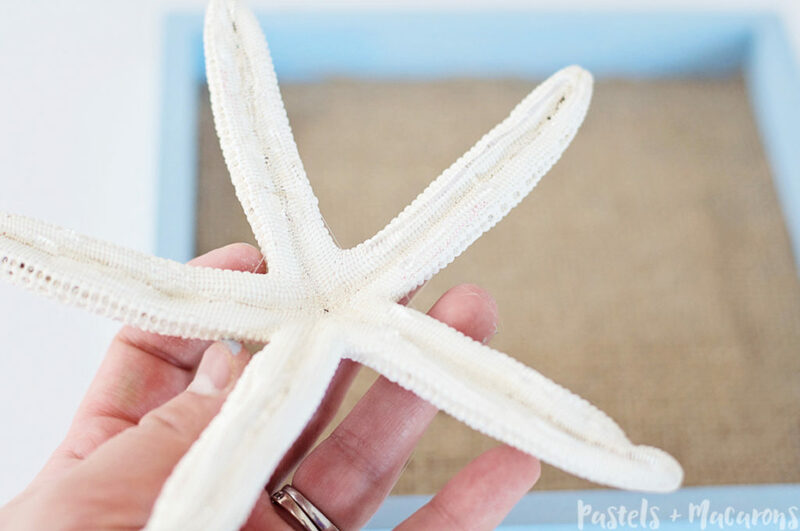 It was fabulous and aside from ground to the gym and having a nice time in the sauna and spa I also got to make this starfish wall art for Cooper’s nursery. A project well over due. I have been trying to decorate Cooper’s nursery for over 12 months without much luck of finishing it. I really don’t know why. I think I have a bit of an issue that I start a million projects and never finish any and add some kids and no help from family or friends and that creates one big mess of unfinished projects and dreams! Haha. But I’m slowly working my way down the list and I’m hoping I can share the finished nursery with you guys in the next month or two! 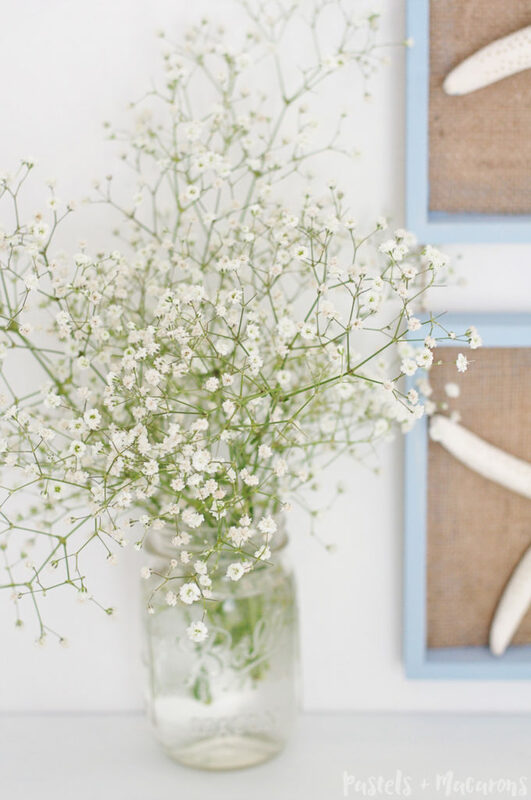 Before I start with the finer details of how to make this project I just want to say how pretty is this gorgeous Baby’s Breath (proper name Gypsophila- totally Googled that for you!). I LOVE these flowers. I had them in my displays for my wedding and I just loved them. So small and delicate but they last and they’re actually really resilient. I love the name Baby’s Breath. So pretty. I have two displays right now with them. This one in a mason jar which is still going strong two weeks later and one on my desk in a rustic vase that I love. * This post may contain affiliate links for your convenience and at no extra cost to you. For more information please read my disclosure policy. 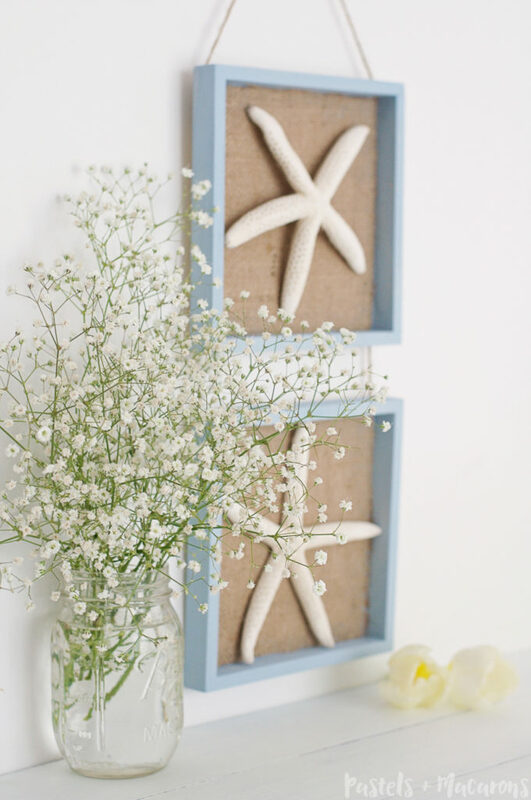 Alright, now that I’ve stopped daydreaming about adorable tiny flowers and sharing my love for them with you we can get on to learning how to make this DIY starfish wall art. 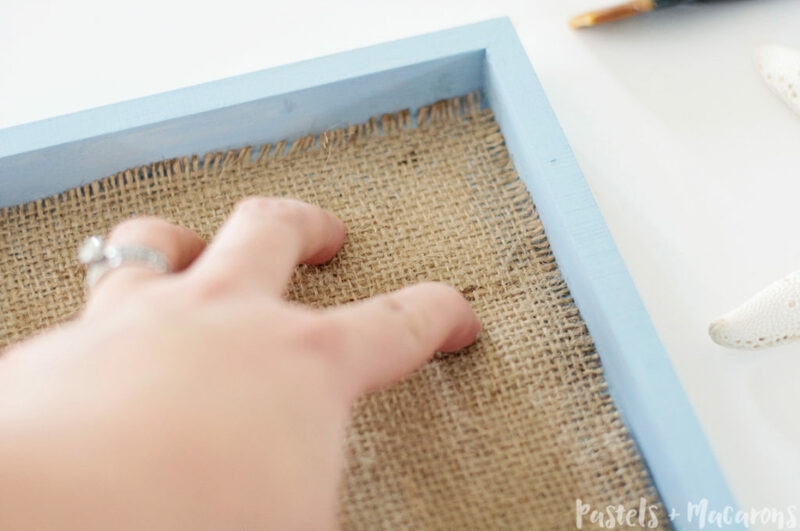 Step 1: Place your frames on the burlap material and trace the outline of the frame. 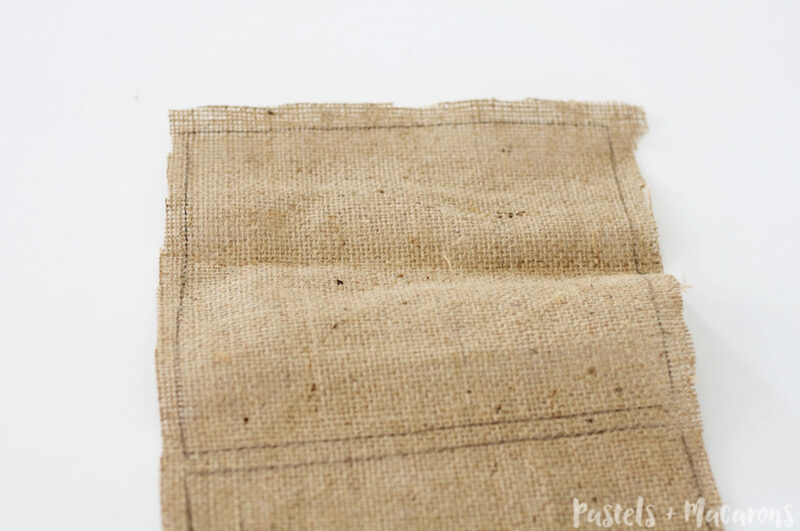 Step 2: Once traced, cut the burlap fabric. Make sure to be precise with your lines so it fits into the frame perfectly. 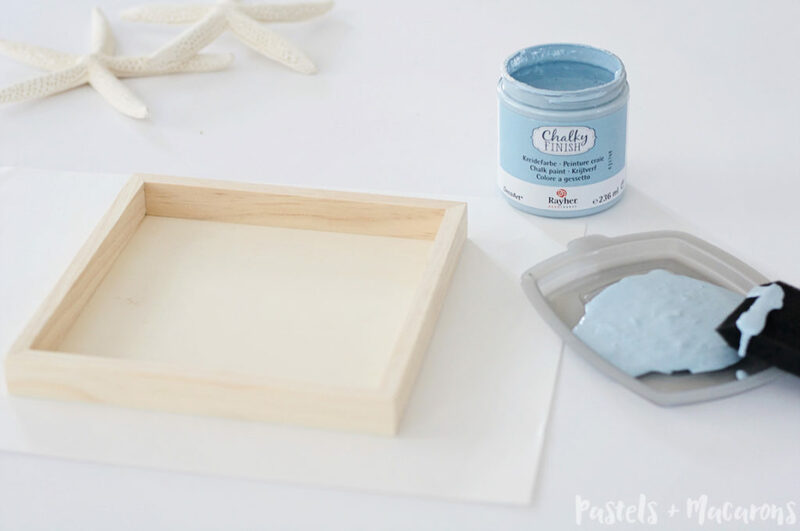 Step 4: Using an old brush, paint all-purpose strong hold glue on to the inside of the frame. Do not brush up the sides, only where the burlap fabric will be placed. Be thorough but don’t over do the amount of glue. 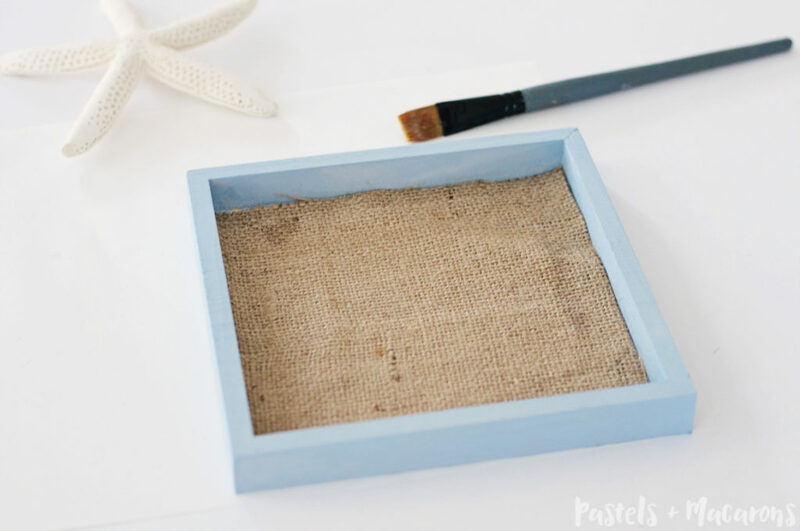 Step 5: Place the burlap material on the glue covered frame. Make sure to press down on all the edges and corners and smooth it out. Hold down for a minute or two. I used small books and placed it on top. Worked very well. 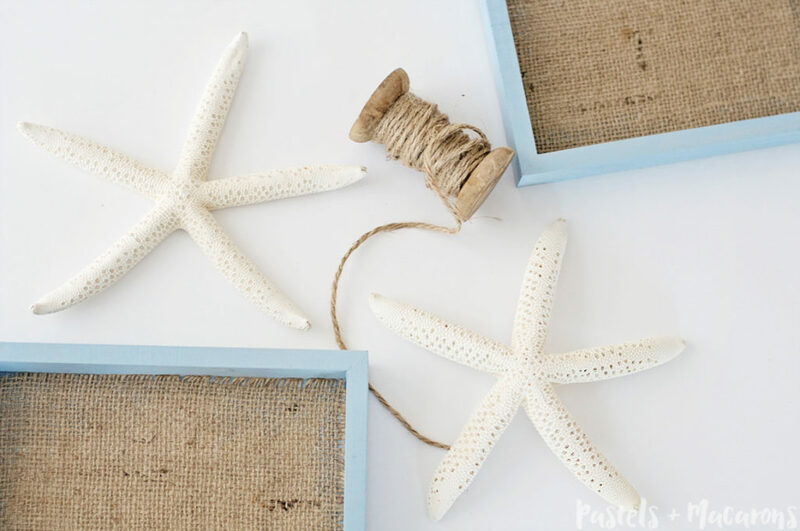 Step 6: Once the burlap fabric is stuck on to the frame and the glue is set, place hot glue on the back of your star fish and gently place on the burlap. Hold for a few seconds and add extra hot glue if need be. 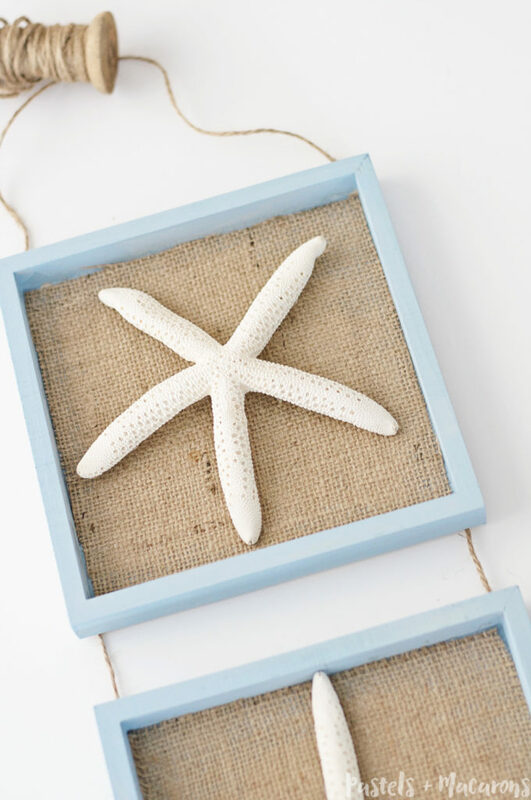 Step 7: Measure out the amount of twin you will need for your starfish wall art to hang nicely in your space. I didn’t want mine to hang too low. Once you have measured it out, cut and get ready to stick it down. (I just couldn’t find mine and I’m also all class). 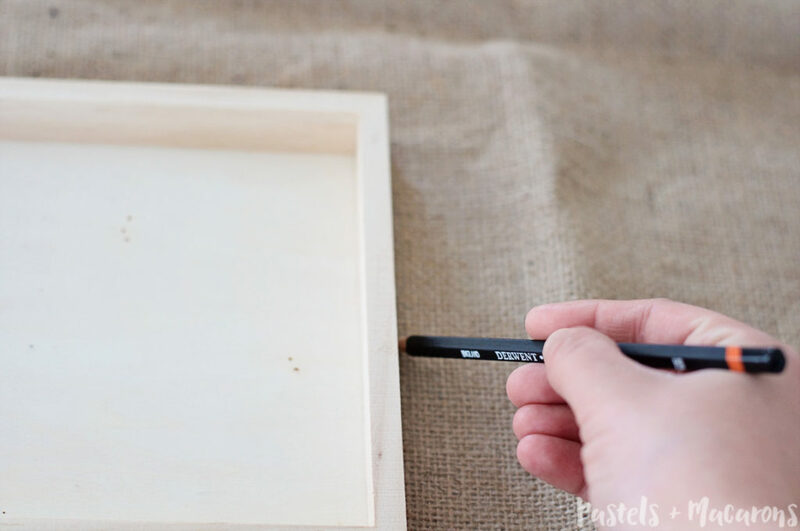 Allow the hot glued twine to set on the frame. Once the glue is set it’s all done and ready to hang! Here’re the end result! Easy huh! This didn’t take long at all. 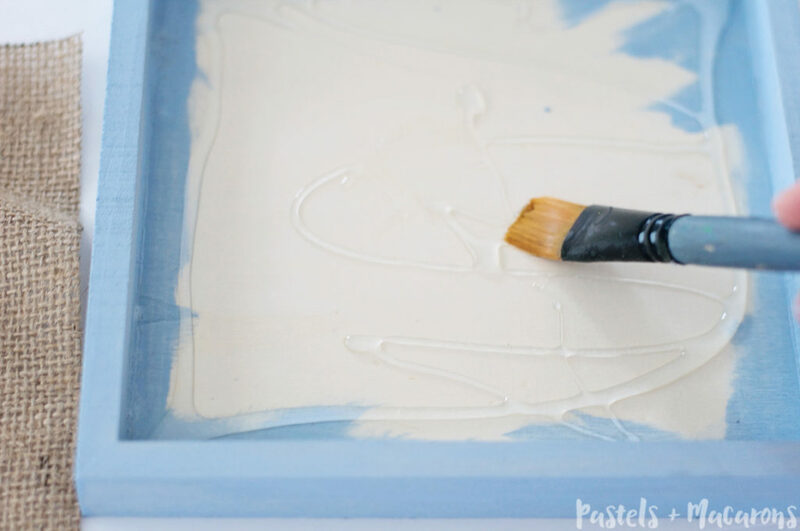 Remember chalk paint dries in minutes ( I only used a small amount and painted a think layer) so I was able to complete this project in about 30 minutes. 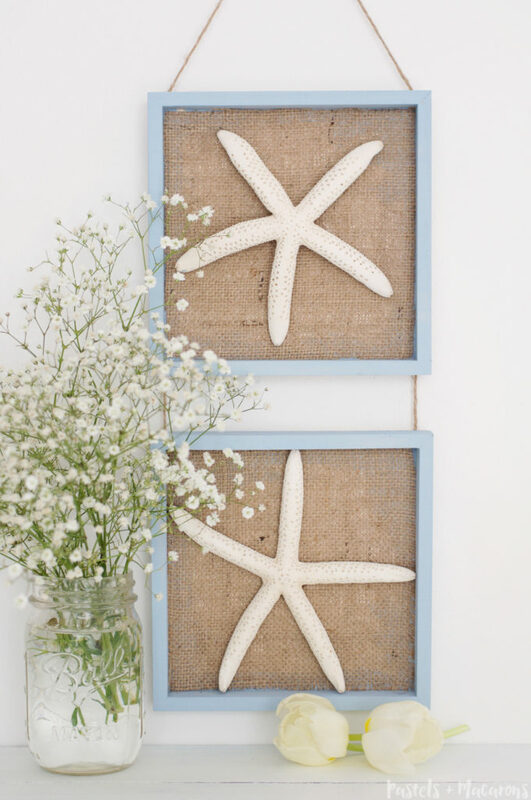 I’m so happy with my cute starfish wall art! 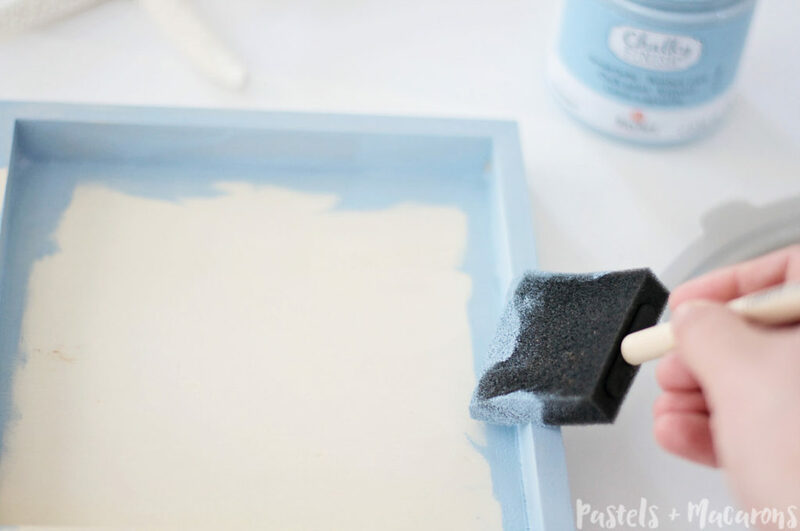 The thing about this craft is it is perfect for my sons nursery but also for any spot in the house! 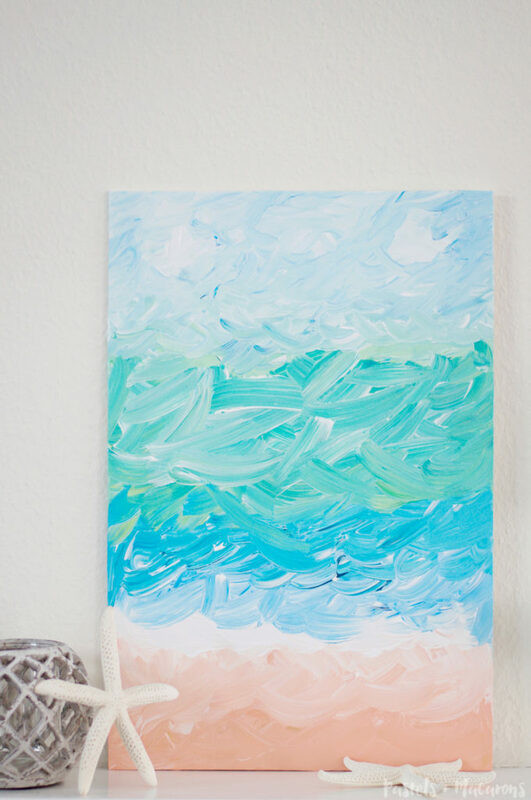 If I want to use this for my Summer decor, I can easily put it in another room in my home without it looking like it was made for a child’s room. Some more baby’s breath prettiness! You getting bored of it yet? haha. 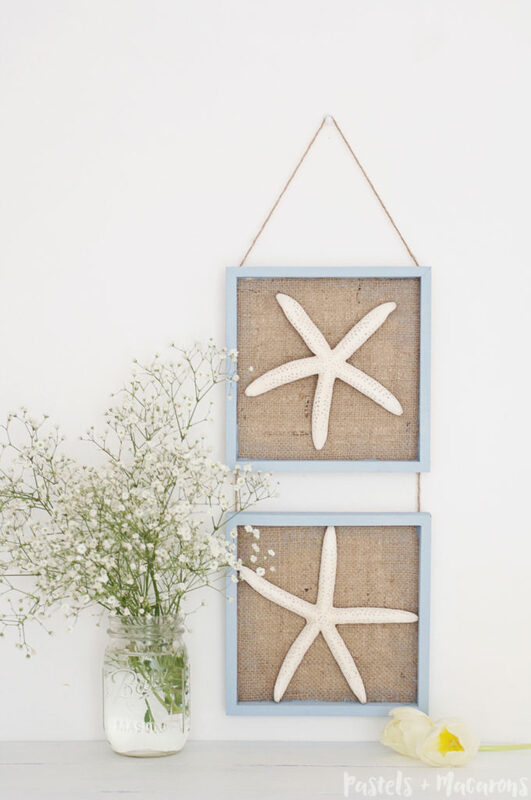 What do you think of my Nautical Wall Decor Starfish hanging? Have you made anything like this before? 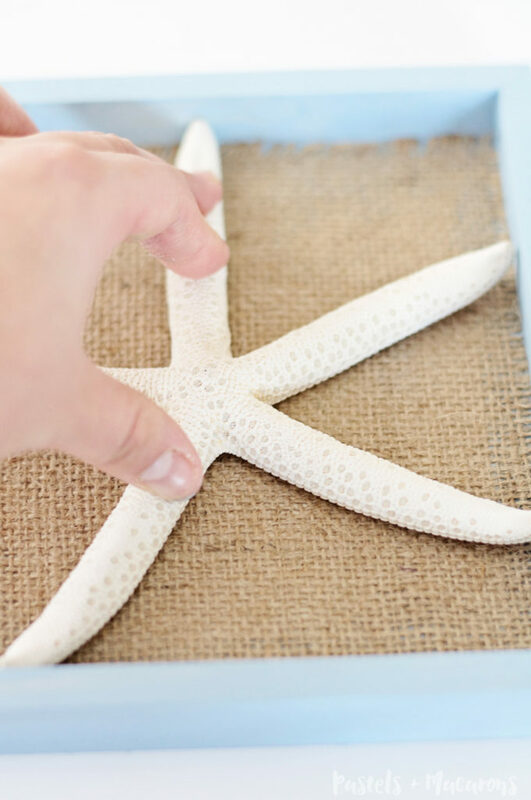 What have you made with starfish? 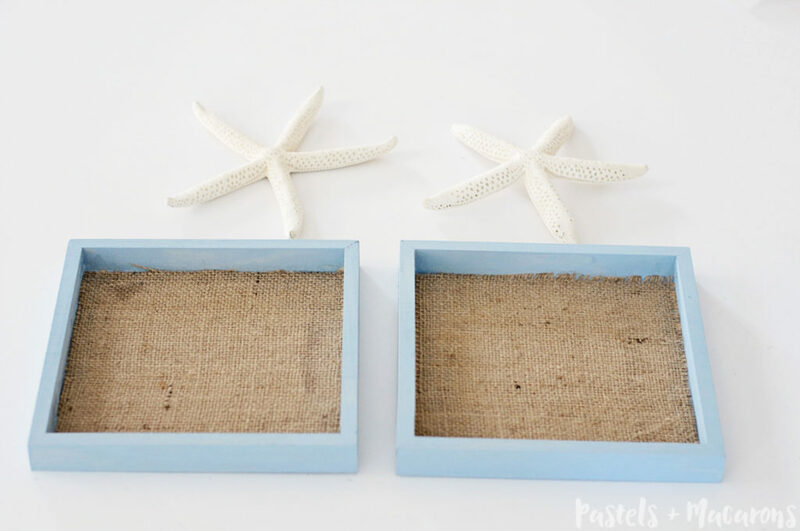 Want to see more simple crafts? 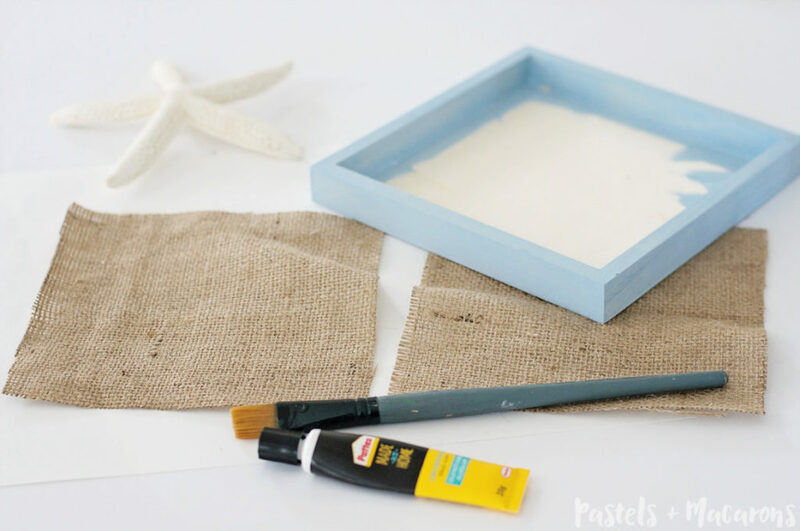 Why not check out some of these easy to make projects! I love this Maria! How cute for a nursery or any other room! 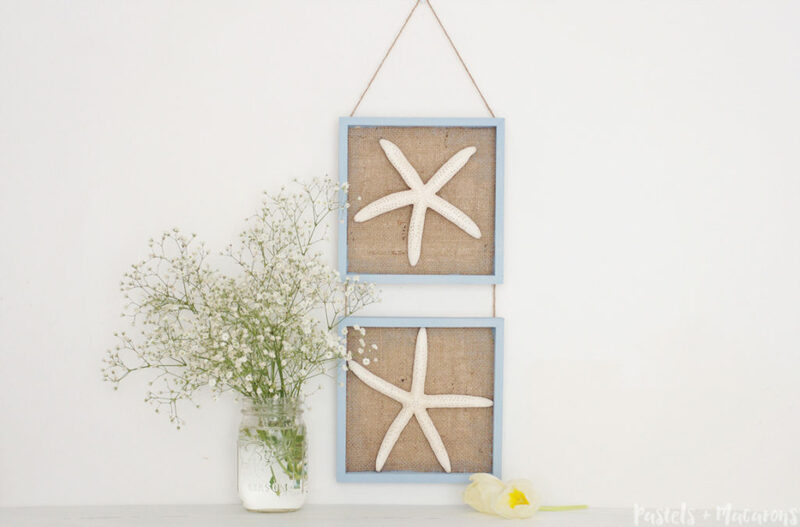 Like you said, this is a fun decor for the whole house, I live right by the sea, so it would be cool to make some of these! Love the burlap as a background!!! Now u got me inspired! Thank so much Katrin! Glad you like it. Lucky you for living right next to the ocean! That’s my husband’s dream! Yes, I love the burlap! 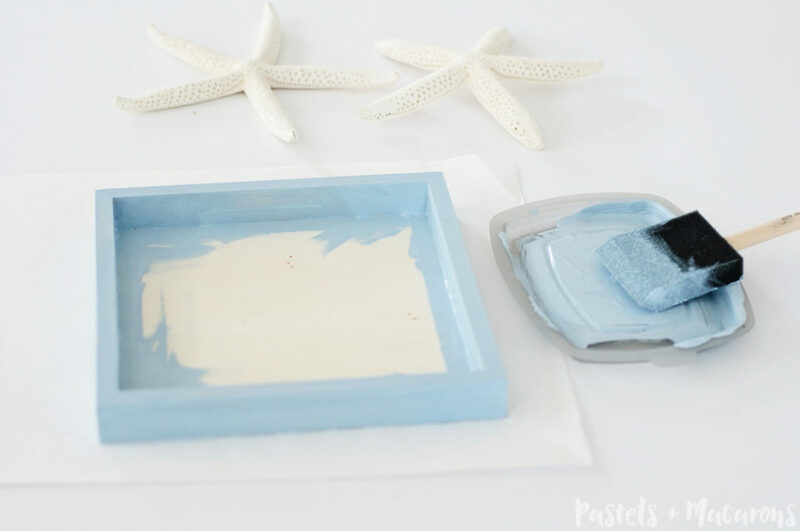 I really like that and it looks super easy to make! I love babies breath too and grow a small patch in my garden. It really does look great in a vase by itself or mixed in with other flowers as a filler. I love how you set the shot up for this too. It looks great! Thanks you Sheri! Baby’s Breath is just too pretty isn’t it! 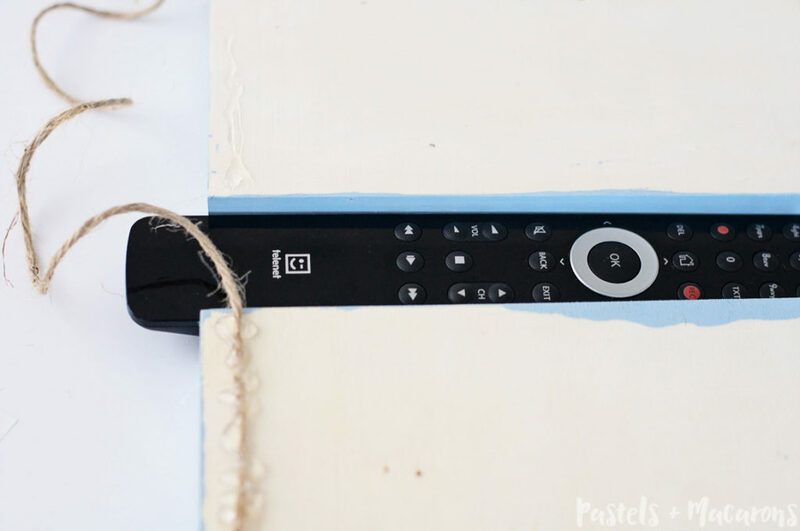 This project is so easy to make. It’s what I’m about since I’m a time poor stay at home mum to two toddlers! 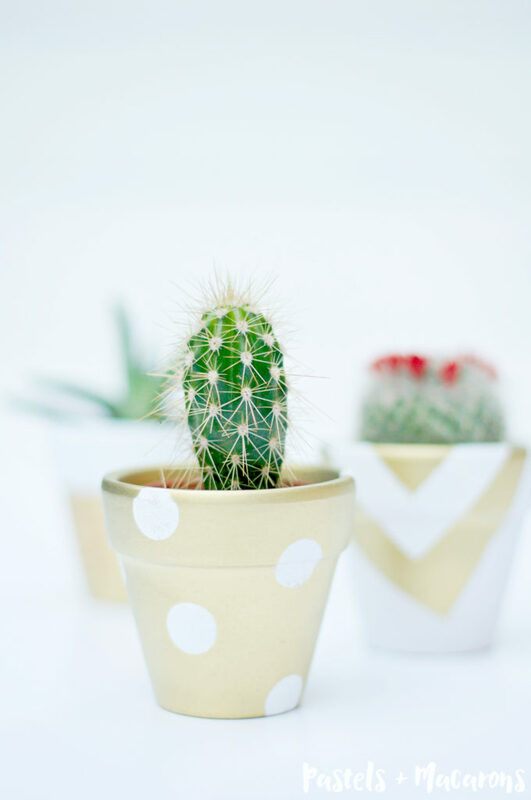 Love the outcome of this DIY! Cute and fast. Pinning! Hi Maria, first of all, I completely get how you are feeling right now. I feel like I’m spinning my wheels doing all the blog ‘business’ stuff that I don’t have time to create! I know this is probably a temporary thing, but when I read your opening paragraph I felt it could’ve been me writing it! 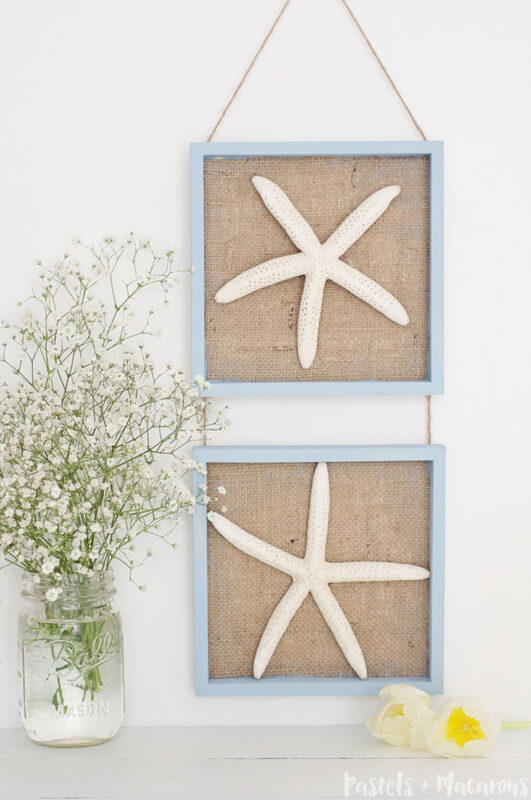 But back to your oh so wonderful starfish wall hangings. I live right near the Atlantic and this picture/hanging would be perfect in my home. Thanks for the suggestions and the detailed tutorial. Much appreciated. I feel you on starting too many projects and then never finding the time to finish them! Love how the wall hanging turned out. Thank you for sharing at Merry Monday! This looks so simple to make but so pretty! I love beauty decor. I love this look. This will be featured on my blog tomorrow. Thank you for sharing on Idea Box link party! This is so cute! So simple but such impact! BTW, I can totally relate to your comments on blogging and the ideas running through your head all the time. Not enough time in the day! 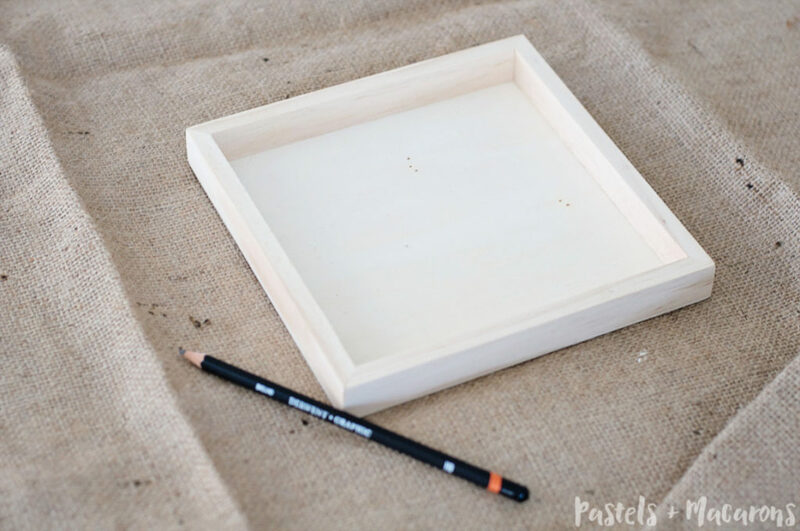 I love this craft, it is so simplistic but so pretty! Looks like something you could buy! Thanks for sharing at Merry Monday! Wow! The decor in your home is gorgeous! The nautical accents are so cute and look so good with the colors in that room! 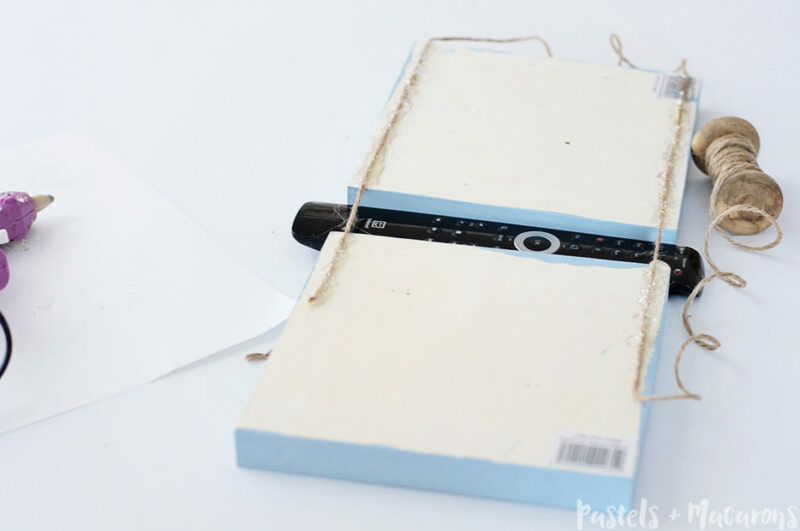 This seems to be an easy DIY craft; it really helps that you gave such thorough instructions for your readers to follow. Great post! Thank you so much for sharing!